George Street, home to Aspinal's Edinburgh store, is the most prestigious location to shop within Scotland's capital. The wide streets and historic buildings provide a suitably grand setting for our beautiful, arched windows and elegantly designed store. Step inside to shop our wallets, purses and handbags and add a distinctive touch to your chosen piece with our in-store personalisation. 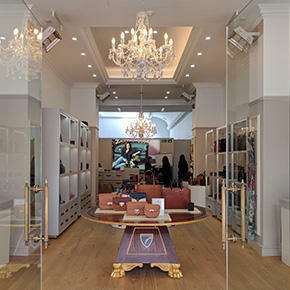 Our shelves are lined with intricately crafted jewellery and cufflinks, essential travel accessories and an array of gifts, from leather hip flasks to elegant jewellery boxes. It is an essential destination for local style hunters and a must-visit, for tourists and travellers looking for a slice of luxury.